The concentration of CO2 at the observatory on Mauna Loa, Hawaii, has exhibited a continuing increase since 1990.6 Figure 1 shows this increase through 2000 with annual oscillations due to the summer growth of continental and marine vegetation in the northern hemisphere which extracts CO2 from the atmosphere in the summer and releases it in the winter. 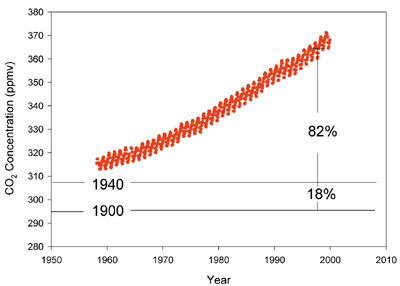 Solid horizontal lines show estimated levels which prevailed in 1900 and 1940.7 The magnitude of the atmospheric increase during the 1980s and 1990s was about three gigatons of carbon (Gt) per year. This compares to 5.5 Gt per year estimated for the human release of CO2, primarily from coal, oil, and natural gas, and the production of cement. However, these numbers are small compared to the reservoirs of carbon: 750 Gt in the atmosphere, 1,000 Gt in the surface ocean, 2,200 Gt in the vegetation, soils, and detritus, and 38,000 Gt in the intermediate and deep oceans. It is apparent that CO2 is increasing in the atmosphere, whether for natural or human causes. However, does this rise in CO2 result in increased warming of the atmosphere? 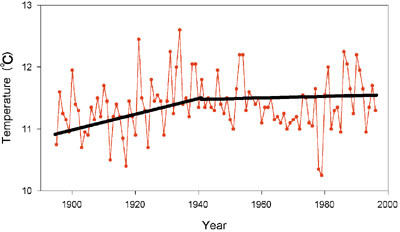 Figure 2 shows the annual mean surface temperature in the contiguous United States between 1895 and 1997 as compiled by the National Climate Data Center.8 The trend line for this 103-year period has a slope of 0.22oC per century. Note, however, that the slope from 1940 to 1997 is much lower at 0.08oC per century during this period when the greatest increase in CO2 was observed. The greatest rate of estimated warming does not seem to coincide with the period of greatest increase in atmospheric CO2. Questions have been raised about the accuracy of the surface temperature measurements used in these calculations. For example, the so-called "heat island effect" may have caused the temperature observations to be biased to higher values toward the end of the century as weather-observing locations were encroached upon by growing cities. It is well known that temperatures in cities exhibit higher temperatures than surrounding countrysides. It is likely that 100-year-old weather stations have a built-in warming trend due to this effect. In an attempt to remove this bias, temperature trends of radiosonde measurements from 63 upper-air stations between 90°N and 90°S latitude from 1958 to 1996 and measurements of a satellite microwave sounding unit between 83°N and 83°S latitude from 1979 to 1997 of global lower tropospheric temperatures were studied. Both of these systems show a slight decline in temperature since 1979. These temperature trends all fly in the face of projections by the United Nations Intergovernmental Panel on Climate Change (IPCC).9 The IPCC has routinely stated that increases in global atmospheric temperatures by as much as 5oC (10oF) would occur if the concentration of CO2 were to double. The IPCC has been the primary source of scientific expertise which has led to the Kyoto agreement that CO2 emissions be cut drastically in developed countries. Recommendations by the IPCC are based primarily on the results of global climate models which still do not include an adequate treatment of many physical mechanisms like cloud cover. In March of 2001 a significant paper by Richard Lindzen of MIT was published in the Bulletin of the American Meteorological Society which addresses the cloud-cover feedback mechanism.10 Dr. Lindzen has been a long-time critic of the IPCC and a highly respected researcher in the atmospheric sciences. His paper reports that clouds in the tropics respond to warmer sea-surface temperatures (SST) by permitting long-wave radiation to space to increase, causing greater cooling of the atmosphere. This negative feedback mechanism would more than cancel all the positive feedbacks included in the more sensitive current climate models. Dr. Lindzen calculated the average SST as a function of cloud cover and found a strong negative relationship. His explanation for the negative relationship is that warmer SSTs lead to higher humidities and greater convective activity. This greater convective activity is more efficient in creating rainfall, leaving less moisture to form cirrus anvils which prevent long-wave radiation from escaping to space. Consequently, warmer SSTs lead to more rapid cooling of the atmosphere and stabilization of the earth's temperature. Richard Lindzen's mechanism works differently than the one I proposed ten years ago, but the result is similar. In either case, God has designed the atmosphere to maintain a uniform temperature, whether there is a cooling or a warming tendency. Only under catastrophic conditions will the atmosphere experience major changes. This type of catastrophic event occurred during the Genesis Flood, but this event involved unique conditions not applicable now. Under normal circumstances, God has designed the atmosphere with a built-in thermostat which maintains thermal equilibrium. This climate condition does not lead to a runaway greenhouse or a new ice age. The view of a climate with a built-in thermostat contrasts strongly with the conventional worldview that the atmosphere is unstable and a minor perturbation could lead to a natural catastrophe of either fire or ice. Seitz, Frederick, 1998, Petition Project: Global Warming Review, see info@oism.org, January. Vardiman, Larry, 1990, "The Christian and the Greenhouse Effect," ICR Impact No. 204, June. Vardiman, Larry, 1994, "Out of Whose Womb Came the Ice?" ICR Impact No. 254, August. Vardiman, Larry, 1995, "A Faulty Climate Trigger," ICR Impact No. 261, March. Gore, Albert, Jr., 1992, Earth in the Balance, Houghton Mifflin. Keeling, C.D. and T.P. Whorf, 1997, Trends Online: A Compendium of Data on Global Change, Carbon Dioxide Information Analysis Center, Oak Ridge National Laboratory. Idso, S.B., 1989, Carbon Dioxide and Global Change: Earth in Transition, IBR Press, 7. Brown, W.O. and Heim, R.R., 1996, National Climate Data Center, Climate Variation Bulletin , 8, Historical Climatology Series 4-7, December. Houghton, John T. et al., 1995, Report of the Intergovernmental Panel on Climate Change, Cambridge University Press. Lindzen, Richard S., Ming-Dah Chou, and Arthur Y. Hou, 2001, "Does the Earth Have an Adaptive Infrared Iris?" Bulletin of the American Meteorological Society, 82, 417-432, March. * Dr. Vardiman is Chairman of the Astrogeophysics Department at ICR. Cite this article: Larry Vardiman, Ph.D. 2001. Earth's Climate Thermostat. Acts & Facts. 30 (9).